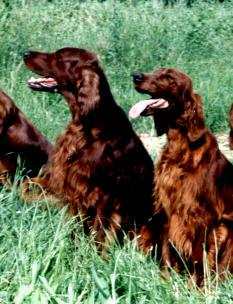 Our first Irish Setter was Multi Ch Rusty bred by Miss Alenka Pokorn in 1987. She gave us a nice start with her consistent show wins and two lovely litters. Unfortunately Rusty left us in 1997. Piter del Biondo , "Devil" to his friends, was a very sweet gentle giant. He spent a few years with us and managed to win 3rd place in BIS at the Jesenice National show in 1990. Rusty's beautiful son Multi Ch Lui Ankaranski (by Ch Nash) started his show carreer at the Ivory Coast where he lived for some time with his owners and continued it very succesfuly in Slovenia. His best win was R.BIS at the Ljubljana International in 1994. He produced some lovely children. Rusty and Devil's daughter Noli Ankaranska unfortunately left us at a young age after winning CAC's in Slovenia and Croatia and some good FT results. Multi Ch Vicary's Pumpkin finished quietly alongside Lui and crowned her career by qualifying for the 1st FCI World Champion of Champions Show in 1997 as representative of Slovenia. She managed to produce two litters in between and is behind all our current stock. To date she has produced 5 champions (Lux J Ch Red River Ankaranski, Multi Ch Red Renny Ankaranska, Slo Ch Red Ruby Ankaranska, Slo Ch Talitha Ankaranska and VDH Ch Tiffany Ankaranska) and 6 other show winners. We lost Pam end of December 2000. 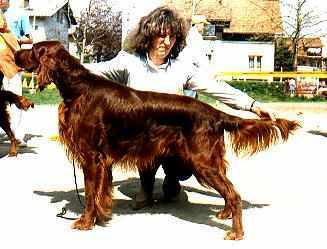 Multi Ch Red Renny Ankaranska has 3 BIG wins to her credit including Champion of Champions contest in 1998. From her one and only litter in spring 2001 by the beautiful Romarne Rialto (Sh Ch Konakakela Zagar by Romarne ex Sh Ch Delsanto Romarna) owned by Gloriana Danze of Napoli, Italy we have kept the lovely Hr & Slo J Ch Zanna Ankaranska. In total of 10 puppies from this litter 9 have been shown so far and have all been highly placed and rated "excellent". 3 of them are already FT qualified, 2 others have Junior FT's and 3 have won CAC's at only 18 months old. We are very happy our puppies found such good homes. As we breed rarely our next litter will probably be from Zanna in 2-3 years, but we would be glad to put you in touch with other breeders.